You had me at triple chocolate! Delicious as always. I am now craving cookies. And fudge, that word always sticks out for me. I can spot at from a mile away. Yum! I love the simplicity of this recipe - it sounds delicious! Definitely going to make this. Thanks for posting!. Oh wow! I sent my husband to the store to get the ingredients for this wonderful recipe. Thanks, Christine. Hi everyone, thanks so much for stopping by. Your comments mean a lot to me. Thanks for posting the cake mix to cookie recipe. I have heard of using a cake mix as a base for cookies, but didn't know how to do it. Because I am allergic to chocolate, I'll have to try a different cake mix. I'm thinking that a spice cake mix with pecans added would taste pretty darn spectacular. 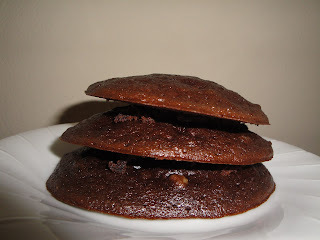 Nothing like rich chocolatey cookies in record time, perfect for busy moms. Thanks for sharing-yum! Wow - the cookies look amazing! I love chocolate anything.... Once again - great history! Great shortcut...how could anything called a triple chocolate cookie be bad???? Chocolate overload just what I need.... As always I love you adding in the historical background..
Cake mix for cookies! Looks super easy. Anything that has mutliple chocolate is right up my alley. Thanks for sharing this recipe! Hi Terri, sorry to hear you are allergic to chocolate. Those sound so delicious..great recipe Christine! By the way thank you for the award! I appreciate it very much! Hey Christine. Not sure if it's just me but when I click your pizza on foodbuzz it brings me here. Just thought I'd mention it. they look yumm cookies!-super like! Scrumptious looking cookies, very chocolatey! Another great mini-history lesson, Christine. You know I love those! Thanks for the chocolate, chocolate, chocolate. So good after a rough convention. Hi Sandra, you deserve the award. They are indeed perfect travel companion... when I used to travel for work .. i always carried some cookies with me. They always gave me company for midnight snacks! I love chocolate, so triple chocolate is all the better! I love the info that you share in your posts Christine! You said triple chocolate and I came running! Great cookies. Mmmmm....triple chocolate for the win. Such an interesting way to make cookies using a cake mix. That looks like chocolate heaven,I'd like one. Can't get much better than triple the chocolate! These look like they would be perfect candidates for ice cream sandwiches!